my Bow bag | escaped. A few weeks ago, I finally pulled the trigger. Got myself a belated birthday present for this year! Blogged about the bag last year when I had to let it go for the sake of the baju nikah I wanted. 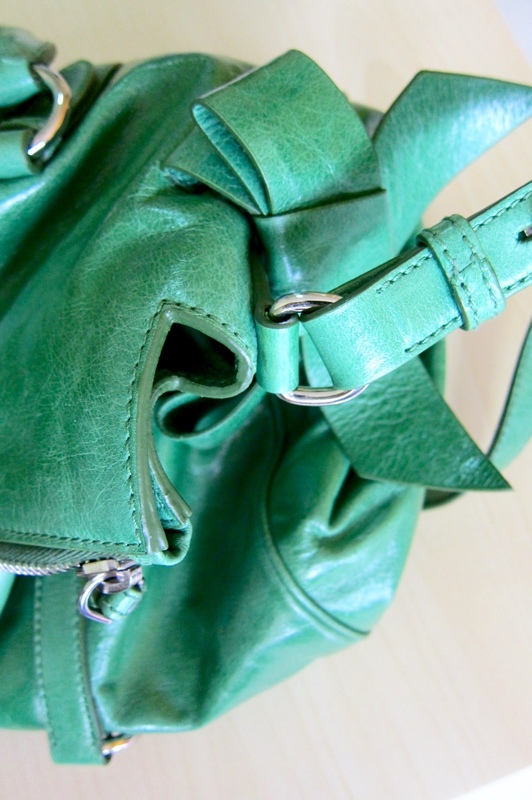 Was not over it yet for almost a year when I finally saw the same bag listed on Reebonz Malaysian website - in a rich green color. Prior to the purchase, I referred to this thread dedicated to the bag on tPF - basically everything I needed to know before hitting the Add to Cart button. Read reviews on Reebonz on the net, too, because I didn't want to be duped. Not many reviews found except maybe one or two good reviews, but the site looks convincing enough so I took the risk. What do I think about Reebonz? The company is based in Singapore, I think - but they have the Malaysian website too so somehow that's a relief for me. At first I thought the bags come from their HQ in KL, but apparently for my bag, it came from Singapore - and there was no custom issue involved, thankfully. Placed the order, received confirmation email, and received the bag after 3 days :O For an international based company, gotta love their efficient shipping! When I opened the huge black box, it was somehow nerve-wrecking because I've read about how the leather can be stiff and too flashy that in some cases, the owners ended up hating it when they could finally touch it. The size is tricky too - the bow bag comes in mini and regular, which I chose the latter as I felt like the mini is too small for my needs. Not the case for me - touched the bag and I was in awe. The leather, the shape, the smell, everything - it was perfect! 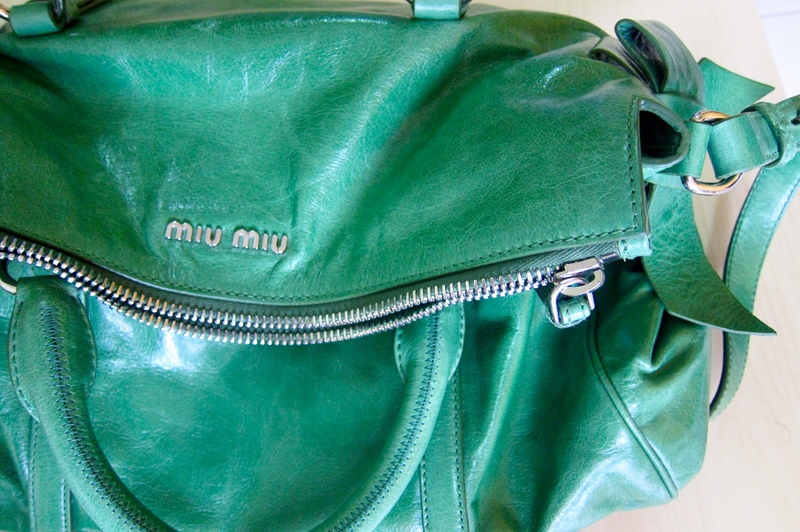 It's a glazed leather in Verde (rich green color) with silver hardware. The leather is not as stiff as I've imagined, and not too soft either. It's a structured bag, exactly as I pictured it. 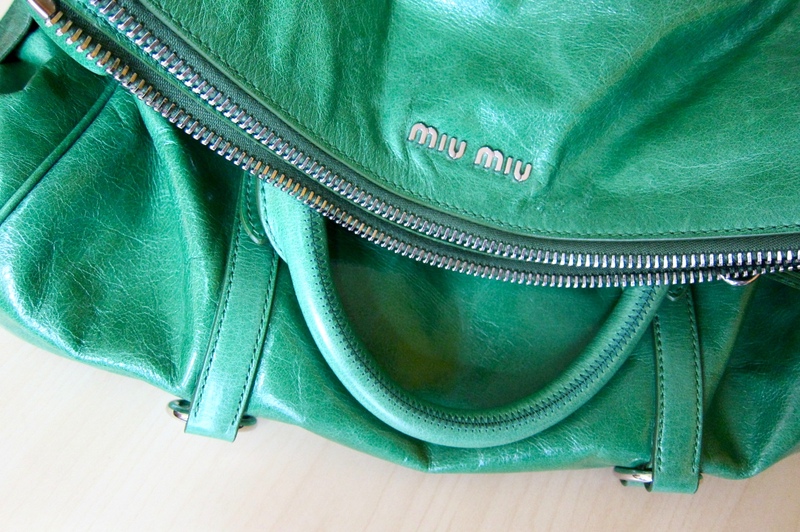 "This is my favorite Miu Miu color as of this post. I adore it! I dream of them making bags in this color. With silver hardware, of course"
Finally a bow to call my own. Bowie, how I've missed you!